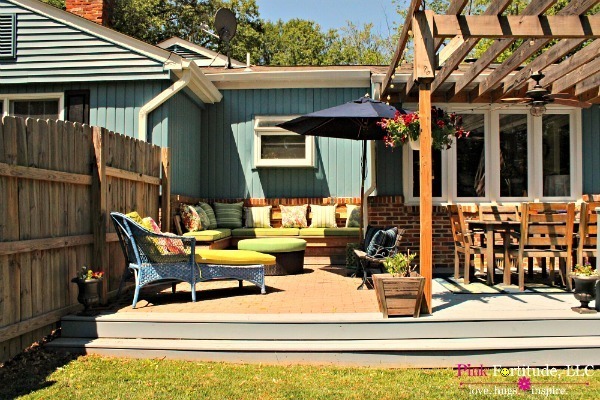 Last year’s transformation of this mud pit to a built-in bench on our deck was incredible. I have since updated with all new pictures so kick back, put your feet up, and enjoy! When I said that the “before” was a mud pit, I was not exaggerating. Not even slightly. It needs some love, don’t you agree? Thanks to our Property Manager, Chris, and his group of talented men, it looks a little different now. Oh and BTW – one of my biggest pet peeves with looking at before and after pictures are when they are from different angles. With me, you will get the same angle so you can see the difference, but also some other angles too. Do you have the same pet peeve about before and after pictures? It’s a pretty amazing transformation, don’t you agree? Especially now that we painted the house from beige to blue! This became the “conversation area” of the veranda. The original deck remained the “dining area.” Instead of continuing with the wood deck, we went with the brick to create a visually distinct area. The Sunbrella cushions and pillows came from everywhere. I mixed and matched from Pottery Barn, Orvis, Gardners, Plow and Hearth, and Grandin Road. Throughout both sides of the veranda, blue is the primary color of the decor, and lime green (or citron) is the secondary color. We wanted the ottoman to be a place where drinks can be served, or we can kick our feet up at the end of a long day. Do you see the blue bench in the corner of the picture below? Remember how my Father re-built it – it was my GREAT-Grandfather’s bench. Click HERE for the full story. You can see the entire veranda transformation HERE. I updated pictures on that post as well. This area gets sun in the middle of the day, but shade in the late afternoon. The umbrella can be moved around to provide shade if needed. Are you ready for one last look of the before and after? Here is the same angle of the before and after so you can see the transformation. Love, hugs, and kicking my feet up. Finally. Holly, this looks fabulous! And I am sure the wisteria will provide tons of shade. Please make sure it is trimmed every year and kept away from the house and roof area. Wisteria is aggressive and invasive and will destroy your roof and house, if given the opportunity. I lo-oove it! So cozy and inviting. But I have to ask, do you put away the cushions or leave them out? I put mine away and it’s a bit of a pain when you have to drag them all out before you can enjoy the space. Looks great, but did you another deck beside the old one and then lay bricks on top of it? 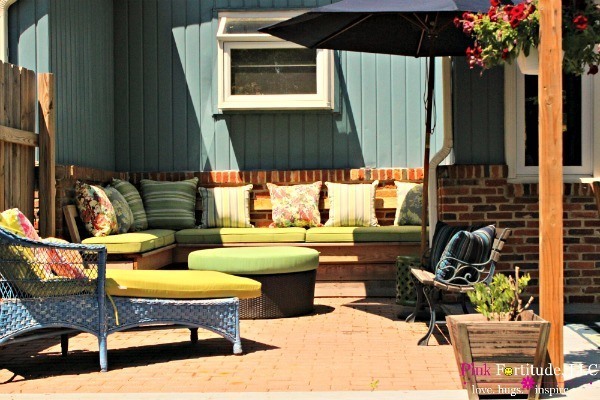 You did a fabulous job on the mud pit:) I love your new outdoor space—perfect for relaxing, having guests over…My favorite part is how you utilized the corner and now it is a cozy couch. Nicely done! found at inspire me monday linky. 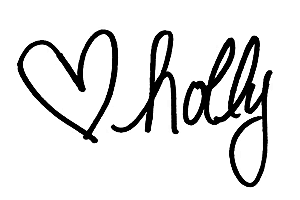 Have a great week Holly! Amazing! I want to come over and hang out there. What a nice space! oh man, that looks amazing. my favorite is the built in bench and the ottoman/table. and i totally agree with the same angle pics-it’s how you truly realize a before and after! Oh My Word, this is fabulous. I love this space, what an amazing transformation. Thanks tons for linking to Inspire Me. you would never know that this was the same space! Love the furniture and the colors you chose! Just fantastic! Strong work, the area turned out beautifully! Thanks for linking up at the Wonderful Wednesday blog Hop. We are so glad you came by! Beautiful, Holly!! Thank you bunches for linking up and partying with us! Awesome job…bet you’re loving it!! I would be out there all day if I could. Wow, what a transformation. It looks great. Hope you have a fantastic day! Great job!!!! I hope you enjoy a beautiful summer there! what an awesome transformation, what a great place to sit and relax. GREAT WORK. Happy Saturday SHarefest. Wow! This turned out great. 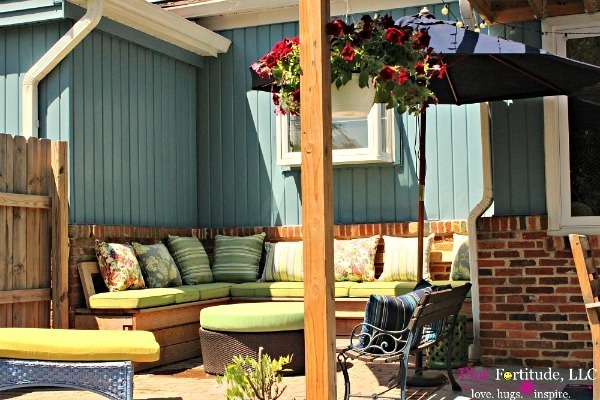 I want to have a beautiful outdoor living area like this for relaxing in the summer or having friends over. totally loving it!! 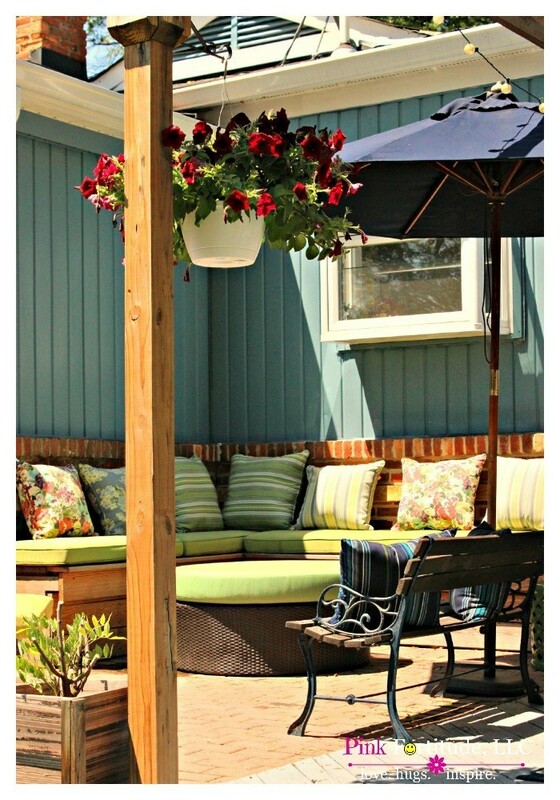 I am showing hubby, I have been asking for a patio area and this will be great inspiration! Great redo! Aren’t you glad you have photos! I wish I could come and enjoy it with you. Have a beautiful weekend on your new patio! That is fantastic. What a transformation! Well my goodness what a great makeover, it looks so inviting and comfy, I hope you will enjoy lots of time in your new out living area!!! Thanks again for sharing!! That is just gorgeous! What an amazing space! Love the transformation. You guys did a fantastic job! Love the colors and that stool too! Want! omgsh! How beautiful!! So love your transformation! You did good!! I’ve just pinned this-what a transformation! Thanks for joining the Say G’Day Saturday linky party. Hope you can join us again this weekend. This transformation is absolutely gorgeous!! Is there instructions on how to make the corner seating area? Love this area so much!!! Thanks for sharing! Wow, what a transformation! You must love using the space and I hope you do every day. We are in the beginning stages of building a deck of our own. I was just wondering how tall it is from the ground to top of patio? Ours will be very short and I like how you did not put a railing around it. It appears that you covered up a crawlspace vent. Do you still maintain adequate ventilation under the house? I like it too – a technical question – I noticed a vent on the foundation in the space that was filled in. What did you do about that? Wow, Holly! What a stunning redo! I know you will really enjoy it this year! Fabulous makeover! Thanks so much for sharing it at Whimsy Wednesday last week. I will be featuring it at tonights link party! Hope you stop by and link up again! What a fantastic makeover! I would love to kick my feet up out here. 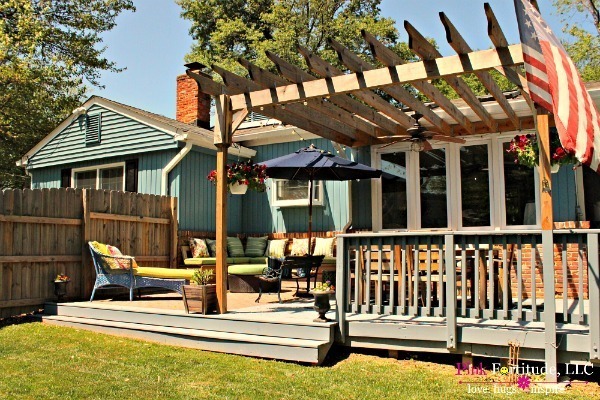 Thanks for linking up with Merry Monday – I’ll be featuring your deck at our upcoming party.